The breakthrough was in money being duplicated: the King gathered real gold and silver into the treasury through the Exchequer, with the tally given in return attesting to the credit of the holder who could enter into trade, manufacturing, or other ventures, eventually producing real wealth with nothing more than a notched wooden stick. So what's the problem? Aren't we just passing around digital versions of the tallies we've been using for almost one thousand years? Aren't mortgages, whether prime or sub-prime, just a modern version of paying for houses with fraud-resistant sticks? George Dyson writes: "Readers of Nassim Taleb's The Fourth Quadrant may enjoy the following piece on fraud-resistant financial instruments of the 13th century—progenitors of a multitude of derivatives that are plaguing us today." "What remedy is there if we have too little Money?" asked Sir William Petty (the author of Political Arithmetick, designer of an ill-fated high-speed sailing catamaran, and cofounder of the Royal Society) in his brief Quantulumcunque Concerning Money in 1682. His answer, amplified by the founding of the Bank of England in 1694, resonates to this day: "We must erect a Bank, which well computed; doth almost double the Effect of our coined Money: And we have in England Materials for a Bank which shall furnish Stock enough to drive the Trade of the whole Commercial World." And in the beginning, there were tally sticks. 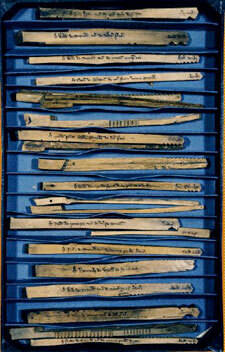 This collection of 13th-century Exchequer "stocks" is stored at the National Archives in London. Petty showed that wealth is a function not only of how much money is accumulated, but of the velocity with which the money is moved around. This led to the realization that money, like information but unlike material objects, can be made to exist in more than one place at a single time. An early embodiment of this principle, preceding the Bank of England by more than five hundred years, were Exchequer tallies—notched wooden sticks issued as receipts for money deposited with the Exchequer for the use of the king. "As a financial instrument and evidence it was at once adaptable, light in weight and small in size, easy to understand and practically incapable of fraud," explained historian Hilary Jenkinson in 1911. "By the middle of the twelfth century, there was a well-organized and well-understood system of tally cutting at the Exchequer... and the conventions remained unaltered and in continuous use from that time down to the nineteenth century." A precise description was given by Alfred Smee, resident surgeon to the Bank of England and the son of the accountant general (as well as the inventor of electroplating, electrical facsimile transmission, digital image compression, an artificial muscle, and other prescient ideas): "Curiously enough, I have ascertained that no gentleman in the Bank of England recollects the mode of reading them," Smee reported in 1850. "The tally-sticks were made of hazel, willow, or alder wood, differing in length according to the sum required to be expressed upon them," Smee explained. The tally sticks were notched to show the amount and inscribed on both sides with the name of the person paying the money along with the date; the stick was then split down the middle so that each side retained a copy of the inscription, and one half of every notch. One part (known as the "stock," thus the origin of this term) remained at the Exchequer and the other part was given to the person depositing their money with the king. As Smee puts it: "Rude and simple as was this very ancient method of keeping accounts, it appears to have been completely effectual in preventing both fraud and forgery for a space of seven hundred years. No two sticks could be found so exactly similar, as to admit of being identically matched with each other, when split in the coarse manner of cutting tallies; and certainly no alteration of the particulars expressed by the notches and inscription could remain undiscovered when the two parts were again brought together." Exchequer tallies were ordered replaced in 1782 by an "indented cheque receipt," but the Act of Parliament thereby abolishing "several useless, expensive and unnecessary offices" was to take effect only on the death of the incumbent who, being "vigorous," continued to cut tallies until 1826. "After the further statute of 4 and 5 William IV the destruction of the official collection of old tallies was ordered," noted Hilary Jenkinson. "The imprudent zeal with which this order was carried out caused the fire which destroyed the Houses of Parliament in 1834." The notches were of various sizes and shapes corresponding to the tallied amount: a 1.5-inch notch for £1000, a 1-inch notch for £100, a half-inch notch for £20, with smaller notches indicating pounds, shillings, and pence, down to a halfpenny, indicated by a pierced dot. The code was similar to the notches still used to identify the emulsion speed of photographic film in the dark. And the self-authentication achieved by distributing the information across two halves of a unique piece of wood is analogous to the way large numbers, split into two prime factors, are used to authenticate digital financial instruments today. So far so good. The breakthrough was in money being duplicated: the King gathered real gold and silver into the treasury through the Exchequer, with the tally given in return attesting to the credit of the holder who could enter into trade, manufacturing, or other ventures, eventually producing real wealth with nothing more than a notched wooden stick. So what's the problem? Aren't we just passing around digital versions of the tallies we've been using for almost one thousand years? Aren't mortgages, whether prime or sub-prime, just a modern version of paying for houses with fraud-resistant sticks? The roots of the current financial meltdown can be found in John von Neumann's "Model of General Economic Equilibrium," first developed in 1932. Von Neumann elucidated the behavior of an expanding autocatalytic economy where "goods are produced not only from 'natural factors of production,' but... from each other..." and proved the coexistence of equilibrium and expansion via the saddle-point topology of convex sets. Some of his assumptions—such as that "the natural factors of production, including labour, can be expanded in unlimited quantities" and that "all income in excess of necessities of life will be reinvested"—appeared unrealistic to others at the time, less so now that Moore's Law, and the zero-cost replication of information, is driving the economy of today. Other assumptions, such as an invariant financial clock cycle, are conservative under the conditions now in play. Von Neumann, who made seminal contributions to digital computing, left a number of distinct monuments to his abbreviated career: among them his "Theory of Games and Economic Behavior" (with Oskar Morgenstern) and his "Theory of Self-Reproducing Automata" (with Arthur Burks). Synthesis between these two regimes is now advancing so quickly that no unified theory of the economics of self-reproducing systems has been able to keep up. Periodic instability should come as no surprise. We may be on the surface of a balloon. Or in the saddle of a dynamic equilibrium—we hope. The unlimited replication of information is generally a public good (however strongly music publishers, software developers, and other pockets of resistance disagree). The problem starts, as the current crisis demonstrates, when unregulated replication is applied to money itself. Highly complex computer-generated financial instruments (known as derivatives) are being produced, not from natural factors of production or other goods, but purely from other financial instruments. When the Exchequer splits the tally stick in two, the King keeps the gold and silver, and you keep one half of the stick. Derivatives are the equivalent of splitting off (and selling) further copies of the same stick—or the "clipping" and debasing of coinage that led Isaac Newton to spend the later part of his life reforming the financial system as Master of the Mint. The result is a game of musical chairs that follows von Neumann's model of an expanding economic equilibrium—until the music stops, or we bring in Isaac Newton, whichever comes first. From MAKE Volume 15, Copyright © 2008, O'Reilly Media Inc.